The castaways are reduced from four down to three and the jurors vote for the winner on Survivor: Cagayan. Tony comes up with a plan for his special immunity idol as the castaways battle to earn a spot in the final four on Survivor: Cagayan. Another alliance woos Tony's closes ally while the rest of the castaways must crack a code to stay in the game on Survivor: Cagayan. Players bit in a food auction while one contestant shows off the immunity idol on Survivor: Cagayan. "Sitting in My Spy Shack"
Tony goes on a stakeout to gather intel on the other players while everyone gets letters from home on Survivor: Cayagan. The Solarrion tribe competes in another immunity challenge and one more member is sent home Survivor. Everyone goes after hidden immunity idols while one tribe member uses ninja-like skills to sabotage another player on Survivor: Cagayan. The two tribes merge into one and the blindsides continue at tribal council on Survivor: Cayagan. The two new tribes participate in both Immunity and Reward Challenges on Survivor: Cagayan. A decision that was made on day one may cause a player to be eliminated and everyone loses their buffs and form two new tribes on Survivor: Cagayan. 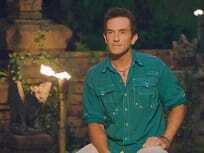 A tribe may throw the immunity challenge in order to get rid of their strongest member on Survivor: Cagayan. 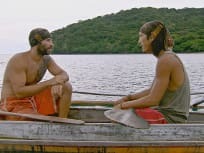 A monsoon leaves the castaways soaking wet while two members start a "blue blood" alliance on Survivor: Cagayan. "Hot Girl With a Grudge"
The premiere of Survivor's 28th season opens in Cagayan where 18 players are divided into three teams. One for brawn, one for brains, and one for beauty.